Photo credit: © Lily Oei. The Farquhar College of Arts and Sciences welcomed acclaimed writer Junot Díaz as the first guest of the college's 2011-2012 Distinguished Speakers Series. The Dominican-American author was the keynote speaker at Nova Southeastern University's 2011 Convocation ceremony, an annual gathering of the campus community to mark the beginning of the undergraduate academic year. 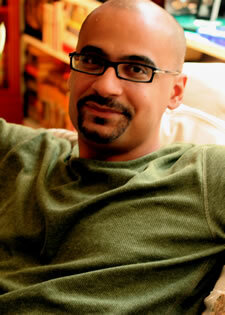 Junot Díaz was born in the Dominican Republic and raised in New Jersey. He is the fiction editor at the Boston Review and the Nancy Allen Professor at the Massachusetts Institute of Technology. The New Yorker magazine listed Díaz as one of the 20 top writers of the 21st Century. His writing often focuses on the immigrant-family experience in America and the Dominican culture as it exists in the motherland and in the United States. Díaz is the author of Drown, a national bestselling collection of short stories which is also published in Spanish, and his first novel The Brief Wondrous Life of Oscar Wao, which earned the 2008 Pulitzer Prize. His novel is the college's selection for the First-Year Reading Program and the recipient of the John Sargent Sr. First Novel Prize, the National Book Critics Circle Award, the Anisfield-Wolf Book Award, and the Dayton Literary Peace Prize. Díaz's fiction has appeared in The New Yorker, Story, The Paris Review, African Voices, Best American Short Stories (1996, 1997, 1999, 2000), in The Pushcart Prize XXII, and in The PEN/O. Henry Prize Stories (2009). Díaz has been active in a number of community organizations and as a critic of immigration policy in the United States. With writer Edwidge Danticat, Díaz published an op-ed piece in The New York Times condemning the illegal deportation of Haitians and Haitian Dominicans by the Dominican government. On May 22, 2010, it was announced that Díaz was selected to sit on the 20-member Pulitzer Prize board of jurors. He described his appointment, and the fact that he is the first Latino to be appointed to the panel, as an "extraordinary honor." Díaz has received a Eugene McDermott Award, a fellowship from the John Simon Guggenheim Memorial Foundation, a Lila Acheson Wallace Readers Digest Award, the 2002 PEN/Malamud Award, the 2003 US-Japan Creative Artist Fellowship from the National Endowment for the Arts, a fellowship at the Radcliffe Institute for Advanced Study at Harvard University, and the Rome Prize from the American Academy of Arts and Letters. He lives in Cambridge, Massachusetts. As part of the college mission to prepare students for rich professional careers and active citizenship, the college frames co-curricular programs and experiences around a broad annual theme that unites our community in interdisciplinary exploration. The academic theme for the 2011-2012 school year was "Truth and Power. "; Díaz was the first of the distinguished speakers for the year to address this theme. Read Junot Díaz's remarks from the 2011 Convocation ceremony.